The other day I spoke about seeing an cows and making a photo of them when I was driving around. One thing I really enjoy is deliberate aimless drives for photography. Set out in the car, pick a direction. If you come to a “T” turn the way that looks the most interesting. If you have a choice between gravel and tar, chose gravel. You will find many things that are known only to the locals. Things that those that stick to the highway never see. Those are the tangible things you’ll find. Intangibles you may find include: peace of mind, space, quiet, solitude, and more that are personal to you. In many ways, I think you’ll find that an aimless drive down the gravel roads is more of a journey than what you’ll find on the highway. 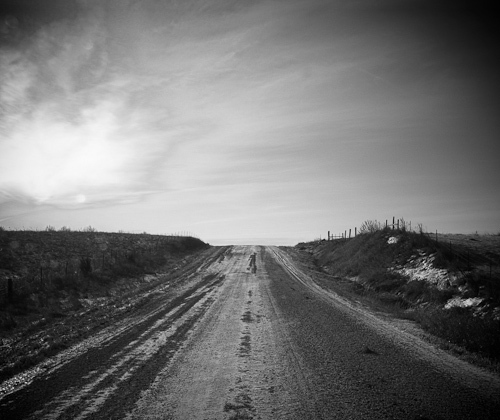 This entry was posted in Uncategorized and tagged copyright ryan ware, country road, gravel road, rural. Bookmark the permalink. I totally agree with you, Ryan. I also like driving into a small town, parking the car and just walking the sidewalks, taking it all in with my eyes and camera.